Ben Bridgens presented “Skin deep: perceptions of human and material ageing and opportunities for design” as a five minute ‘provocation’ at the European Academy of Design 2019 conference in Dundee. Lilley, D., Bridgens, B., Davies, A. 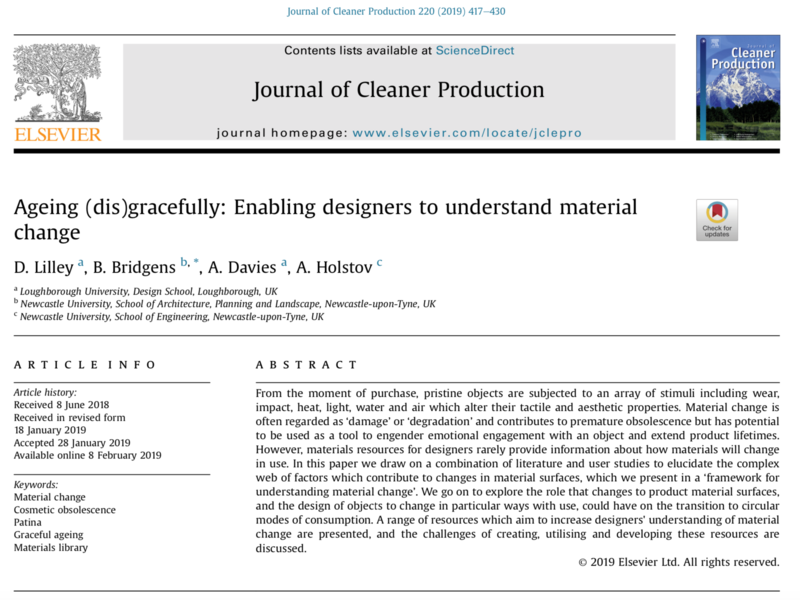 & Holstov, A. Ageing (dis)gracefully: enabling designers to understand material change (2019) Journal of Cleaner Production, 220, 417-430. From the moment of purchase, pristine objects are subjected to an array of stimuli including wear, impact, heat, light, water and air which alter their tactile and aesthetic properties. 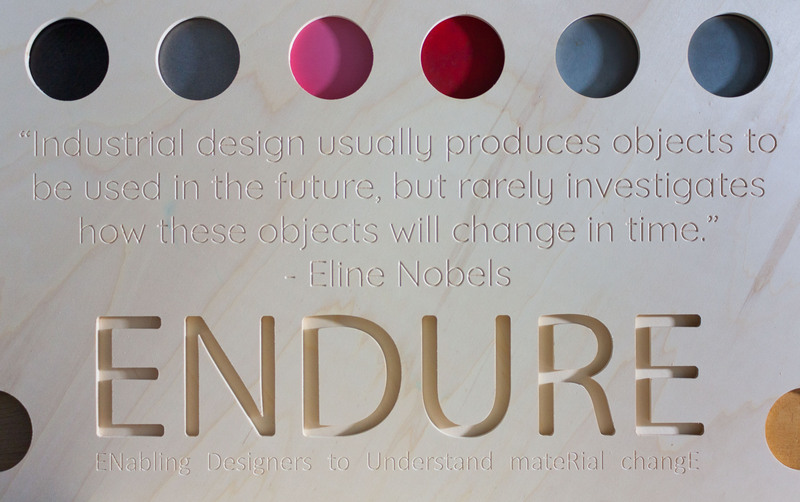 Material change is often regarded as ‘damage’ or ‘degradation’ and contributes to premature obsolescence but has potential to be used as a tool to engender emotional engagement with an object and extend product lifetimes. 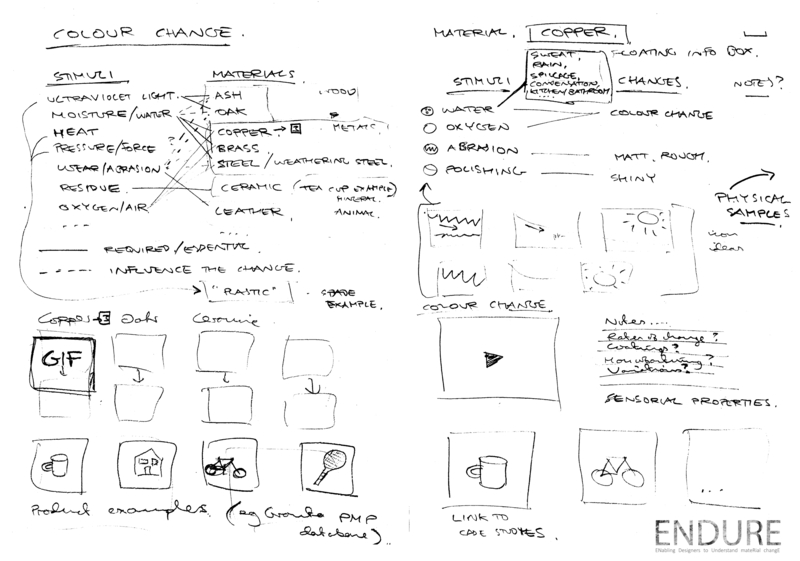 However, materials resources for designers rarely provide information about how materials will change in use. In this paper we draw on a combination of literature and user studies to elucidate the complex web of factors which contribute to changes in material surfaces, which we present in a ‘framework for understanding material change’. We go on to explore the role that changes to product material surfaces, and the design of objects to change in particular ways with use, could have on the transition to circular modes of consumption. 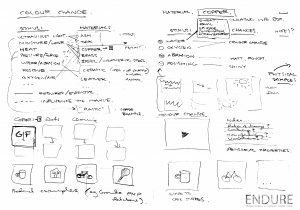 A range of resources which aim to increase designers’ understanding of material change are presented, and the challenges of creating, utilising and developing these resources are discussed. The ENDURE team are delighted to debut a short video demonstrating our vision for the future of materials specification in which material change is a fundamental part of the selection process. Filmed and edited by Andre Brito, the video demonstrates the potential of ‘mixed reality’ enhancements to our prototype app (https://egkz1o.axshare.com password: endure) which allow architects and designers to manipulate the aesthetics and tactility of material surfaces to harness the potential of material change. Our work provides a counterpoint to ‘smart’, digital visions of the future, which are predicated on consumerist models contriving to sell the latest technology, rather than on long term interest in citizens and their environment. 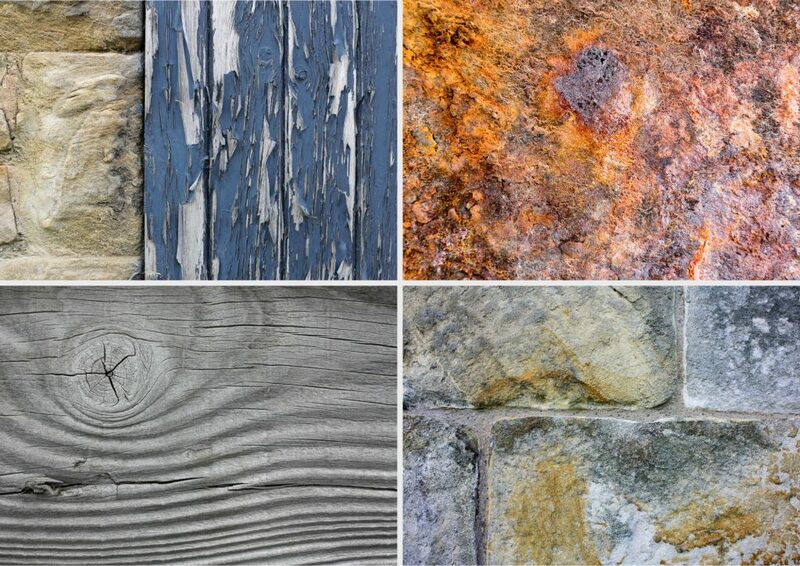 We believe that an appreciation of durable materials and the unique, complex surface patina that develops over decades or centuries provides an opportunity to create a sense of place, a connection between people and the buildings, spaces and objects with which they interact, and engender a desire to care for and maintain the material world, whether or not objects are owned or shared, and whether places are public or private. 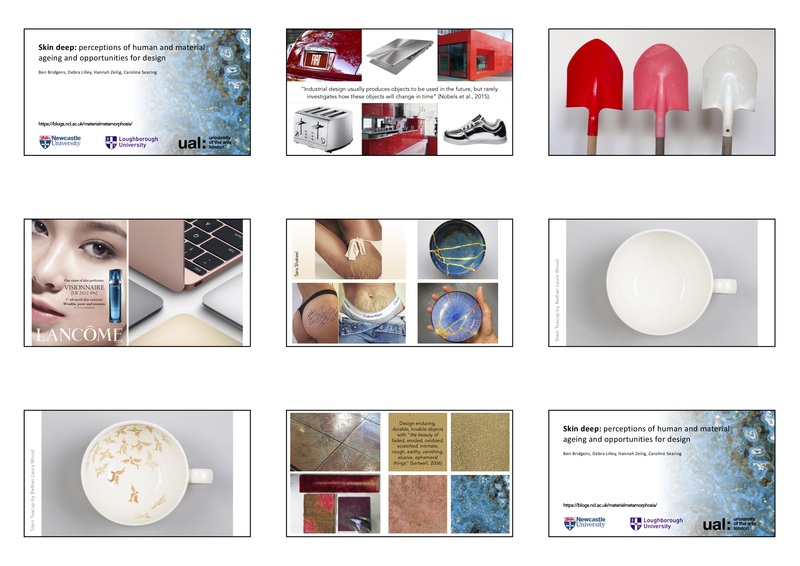 Our paper titled “Skin deep: perceptions of human and material ageing and opportunities for design” has been accepted for presentation at EAD2019, the 13th International Conference of the European Academy of Design, which will be held in Dundee in April 2019 (https://ead2019dundee.com). The paper was written by Ben Bridgens and Debra Lilley in collaboration with Hannah Zeilig and Caroline Searing at the London College of Fashion. Abstract: Rapid unsustainable purchasing and disposal of mass-produced objects is, in part, driven by ‘cosmetic obsolescence’ – changes to the pristine material surface which are perceived as damage and degradation. 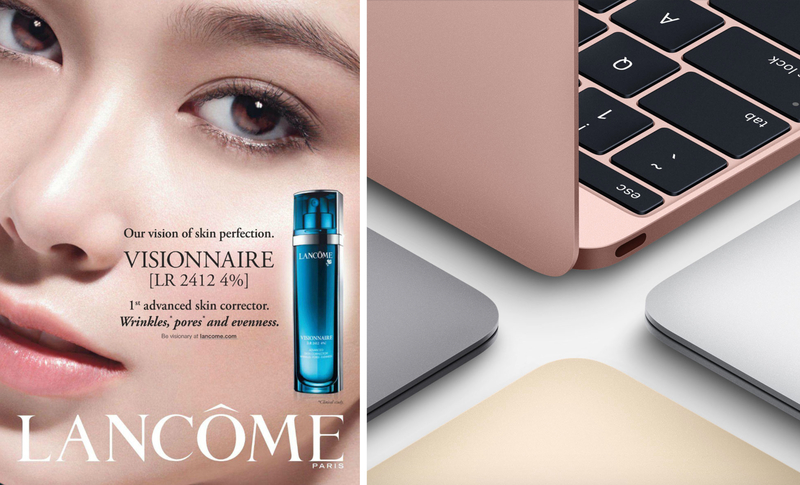 In Western society there is an obsession, fuelled by pervasive advertising, with hiding the effects of ageing and maintaining skin that exudes ‘youthful perfection’. We consider the parallels between these attitudes to changes in material surfaces and human ageing, and propose that actively considering future material change in product design could increase product longevity. Our triangle will form part of a geodesic dome which visitors can walk through and around, showcasing a wide range of materials, from traditional materials to experimental and futuristic materials. ENDURE invites designers, architects and material specifiers in academia and industry to review our app-based resource which explains, exemplifies and illustrates material change. The prototype app provides succinct information on how materials change with use and in response to different stimuli. Changes to how a material looks, feels and behaves are illustrated with inspirational case studies of products and materials, as well as time lapse images and gifs of physical samples subjected to various stimuli (UV, ammonia, salt etc.) and accelerated ageing techniques. We’d love to hear your feedback! please go to: https://www.surveymonkey.co.uk/r/YCLZ7SJto view and evaluate the prototype. 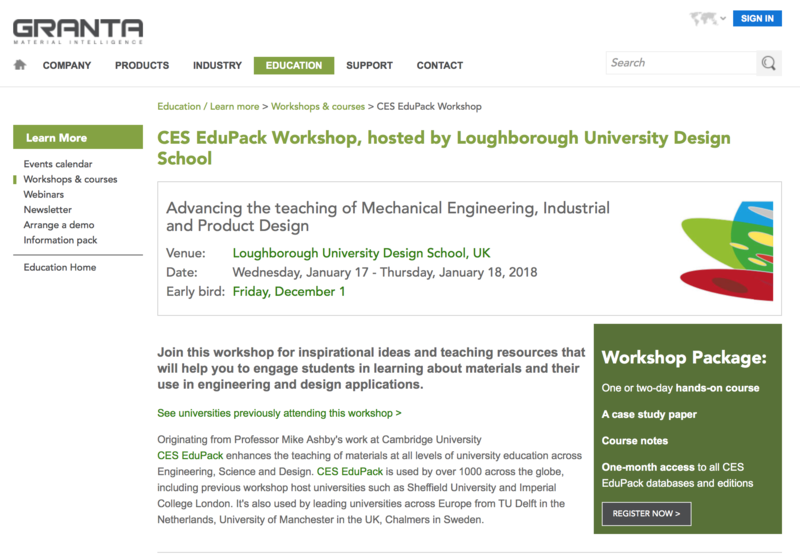 Granta EduPack workshop to be held at Loughborough University in January. 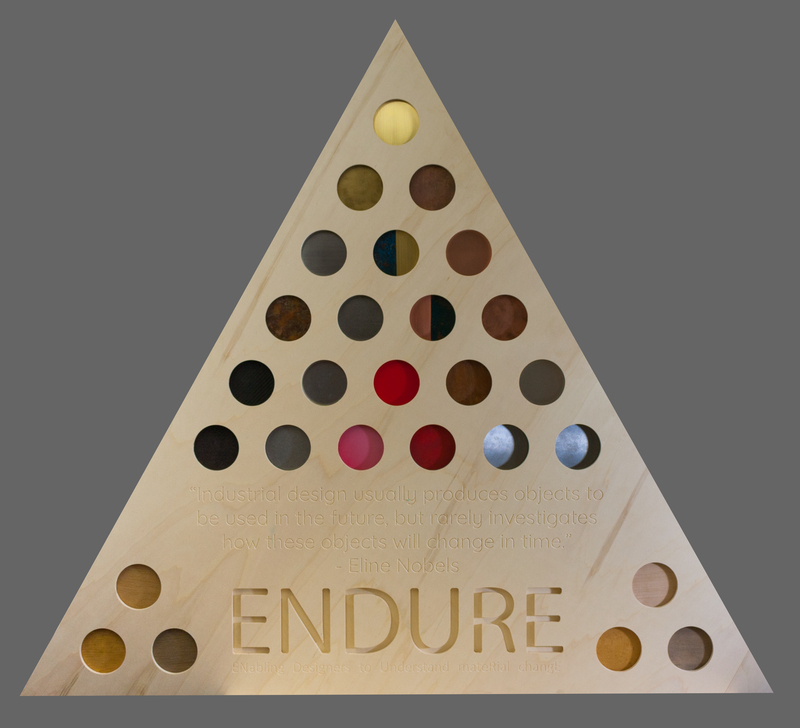 On the second day of the workshop we will demonstrate prototype ‘ENDURE’ resources within the Granta ‘Products, Materials & Processes’ database. And we will be asking participants to have a go and give us feedback on these resources which highlight the role of material change in design. From the moment of purchase, pristine objects are subjected to an array of stimuli including wear, impact, heat, light, water and air which alter their tactile and aesthetic properties. Material change is often regarded as ‘damage’ or ‘degradation’, but has potential to be used as a tool to engender emotional engagement with an object. But how can we convey to the designer the role of the complex interaction of material choice, surface finish, form, physical interaction with the user & environmental exposure in determining the future aesthetics of a product?